Following two recent stories in the Liverpool Echo Birkenhead Market traders say they feel “ignored” over plans for new town market (3rd March 2018) and Inside Birkenhead Market: What traders think about Wirral Council’s plans to revamp it (4th March 2018), I thought it was time to write a piece about Birkenhead Market and its relationship with its landlord Wirral Council. Wirral Council’s Cabinet met on the 18th December 2017 and agenda item 10 was titled “Strategic Acquisition Programme – Birkenhead Market”. One of the councillors on the Cabinet (Cllr Phil Davies) is also a ward councillor for the ward of Birkenhead and Tranmere that Birkenhead Market is situated in. After councillors on the Cabinet had voted to exclude the press and public present from the rest of the public meeting for both that item (which you can view video of below) and an item on the Hoylake Golf Resort. After the item on the Hoylake Golf Resort was dealt with, in private session Cabinet then considered the 8 A4 pages on their agenda that were about Birkenhead Market. This was listed as a key decision relating to lease terms. The decision wasn’t called in by opposition councillors on Wirral Council, but due to the Christmas holidays wasn’t down to be implemented until 18th January 2018. 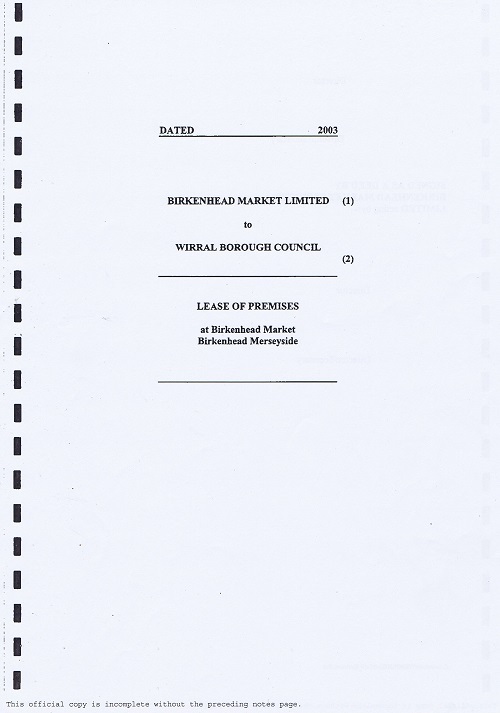 From 18th January 2018 to now, Wirral Council have obviously been in negotiations with Birkenhead Market Limited over the long-term lease (originally planned to run for 125 years from 2003 to 2128). The lease is between Birkenhead Market Limited and Wirral Metropolitan Borough Council. Thankfully I published most of this lease back in 2015 here when I exercised a right granted to local electors under the audit a number of years ago. I left out the names and addresses of all the stall holders when publishing though, as I felt it wasn’t fair to put this kind of detail in the public domain. Tied in with this is also Wirral Council’s recent acquisition of the Europa Buildings (the building the other side of the car park that has Mecca Bingo in) for ~£8.4 million and the recent Cabinet decision to go into a joint venture (Wirral Growth Company Ltd) with Muse Developments (although that’s subject to a 10 working day Alcatel standstill period and a call-in period so I would guess the contract hasn’t yet been signed). Connected to the regeneration of Birkenhead Market is also the Vermont Group. I explained the Vermont Group’s involvement in Birkenhead Market Holdings Limited & Birkenhead Market Regeneration Limited a story in July 2017. There are also Wirral Council’s long-term plans for the redevelopment of this part of Birkenhead Town Centre. The plans have gone through a number of changes over the years as the plans with Neptune Developments (later renamed to Ion Property Developments) didn’t progress for reasons that are somewhat complex to explain here. However back to the present, as far as I can tell Wirral Council since January 2018 have been negotiating with Birkenhead Market Limited in relation to the lease terms. Wirral Council as landlord are one party to the lease and Birkenhead Market Limited another. On the 22nd February 2018, Birkenhead Market Limited informed Companies House that a charge started in 2003 between Birkenhead Market Limited and Royal Bank of Scotland PLC had been satisfied in full. This charge had been secured against the Birkenhead Market property (land and buildings). This appears to be connected in some way to a ~£4 million loan made by Royal Bank of Scotland PLC to Birkenhead Market Limited in 2003. I’ve made a information request for the Cabinet report to Wirral Council, but after a long wait of over a year for the redacted Hoylake Golf Resort contract I’m not hopeful that Wirral Council will provide it in a timely manner! « What are the Conservative and Liberal Democrat budget proposals for Wirral Council for 2018-19? More Wheeler dealers going on! Wirral Council contract out road and pavement repairs on Wirral’s roads to BAM Nuttall. I remember that part of the rationale behind putting tarmac over Wirral’s pavements was because Wirral Council receive less insurance claims from people walking over tarmacced pavements than tripping over paving stones out of alignment! Many residents don’t like tarmacced pavements though! Wirral Council also seem to expect a sinking paving stone to be out of alignment by a very large amount before they will carry out remedial work. Although they (Wirral Council) could top up the money they receive from Government for highways maintenance of Wirral’s roads and pavements, the Labour Administration running Wirral Council chooses not to.